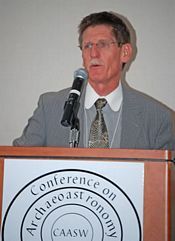 See highlights of the 2009 Conference on YouTube. The proceedings from the 2009 Conference has been published as Volume 23 of the Journal of Astronomy in Culture by the University of Texas Press. To purchase Volume 23, visit their website. A mathematical model of the Sun Dagger Site at Chaco Canyon is constructed and used to analyze the dynamic features of the sun dagger pattern that occurs at summer solstice. The abstract model supposes straight-line shadow casting edges with spatial orientations and a carefully chosen parameterization of these orientations that is highly faithful to the actual site but still amenable to closed-form mathematical analysis. The parameterization was developed using data and observations obtained from the SD Explorer Model, a fully realistic and interactive computer model of the Sun Dagger Site developed by Sofaer et. al. The latter model is based on a finely resolved laser and photogrammatic-based reconstruction of the site and its surroundings. The development of SD Explorer Model and its interactive application will be briefly demonstrated at the outset of the presentation. The abstract mathematical model derived from the SD Explorer data is shown to capture the essential features of the site’s sun dagger image sequence at summer solstice, such as the emergence of the dagger from a point and its downward and slightly rightward motion. Analysis of the model’s behavior as a function of parameters helps to clarify the design and operation of the site. In particular, it reveals the crucial importance of strongly eastward site orientation and the dimensions and placement of cliff overhang feature above the site that have not been emphasized before. Two clusters of axial orientations of pit structures in Chaco Canyon appear as early as A.D. 600 in Shabik’eschee village. These orientations, which were either north-south or rotated 25o east of south, may have developed from early nomadic traditions. A century or more later, the same duality appeared in the northern San Juan in villages along the Dolores River, such as McPhee and Grass Mesa, suggesting differences in ethnicity. The basic pattern was that of the Prudden unit-type pueblo, with a roomblock to the north of a proto-kiva or kiva. Many of the Greathouses in Chaco continued this “front oriented” alignment toward the south and SSE. A radical shift of perspective to alignments ninety degree from the major axes is not justified either by archaeological theory or data. All of the proposed astronomical alignments along the back walls of Greathouses may be the coincidental and unintended consequences of their front orientations. Major lunar standstills appear to have been first discovered and celebrated at the Chacoan outlier at Chimney Rock. Proposals of lunar standstill alignments in Chaco Canyon do not survive scrutiny using current measurements. The three-slab site on Fajada butte, which marks June solstice with the “sun dagger”, was probably associated with the 13th century “pinnacle site” near its summit, but not with the Chacoan Florescence. Astronomy appears to have served the needs of Chacoan society by providing a ceremonial calendar for periodic festivals and pilgrimage, a background for ritual performance, and a technique for establishing true north. Casa Rinconada, located at Chaco Culture National Historic Park in northwestern New Mexico, USA, has been found to have very unique and sophisticated lunar alignments to complement its already reported directional and solar orientations. This large round building within itself hints at a level of lunar understanding and architectural design refinement not before suggested for these ancient people. This presentation and paper will focus on detailing the mechanics of the various alignments with and emphasis on the newly discovered lunar aspects. While these many alignments function today in the 1000 year old ruin that has been partially rebuilt in modern times, there are many questions to be considered prior to inferring intentional encoding of this astronomic knowledge by the original ancient builders. This presentation will also present the evidence from the site and elsewhere that confounds conclusions of intentional encoding of this lunar information by the original builders. We propose that in and near Chaco Canyon, New Mexico, numerous C-shaped sites and two cairn sites may have been intentionally interrelated on alignments to the major standstill moon. These sites are located on the tops of Chacra, South and West mesas and a mesa seven miles northwest of Chaco Canyon. We will present maps, photographs and survey data documenting these possible lunar inter-site relationships. The lunar standstill cycle has been studied and documented by the Solstice Project at the Sun Dagger site on Fajada Butte in shadow markings on a spiral petroglyph and in the alignments of seven major Chaco buildings, as well as in certain inter-building relationships. The research documenting the architectural alignments was conducted with NOAA’s National Geodetic Survey. Research by others has also shown that Chimney Rock Pueblo, a Chaco building ninety miles north of Chaco Canyon, is related to the major standstill of the moon. Over the last five decades, dozens of star/crescent combinations in rock art, particularly in the Southwest and California, have been identified as depictions of the Crab supernova, which was observed and recorded by Chinese astronomers in 1054 A.D. This interpretation originated in 1955, with reports and commentary by William C. Miller on two sites in northern Arizona identified by Miller as White Mesa and Navaho Canyon [sic]. 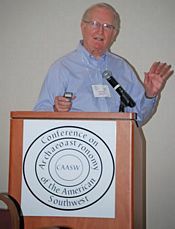 Although the rock art Miller described precipitated a lasting trend of supernova association with star/crescent imagery, the two original panels of alleged supernova rock art had not been re-examined for more than 50 years until the authors established exact locations for these remote sites and reached them in May, 2008. These visits provided an opportunity to see and evaluate the panels in context and prompted reconsideration of the supernova explanation for this rock art. We tested the hypothesis that there is a relationship between architecture and observable astronomy by investigating overall layout, regularity of form, size, construction cycles, and feature placement utilizing a rigorous standardized architectural documentation system and direct observations. Research on lunar standstills at Mesa Verde National Park was conducted at Cliff Palace and Sun Temple in 1990-91. Those studies proposed alignment of architecture for the purpose of observing the Southern Major Lunar Standstill moonset over Sun Temple from Cliff Palace. 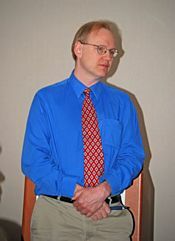 The alignment was suggested by mathematical modeling and fieldwork. We completed a detailed architectural analysis at Sun Temple which supports the hypothesis that the lunar maximum was observed over Sun Temple from the Painted Tower area of Cliff Palace. Tree ring dates at Balcony House and Square Tower House suggest a relationship between construction of specialized architecture such as kivas and the lunar maximum cycle. The results of the research assess the correlation of the lunar standstill cycle with major architectural features, structural form and placement, and construction phases. This will contribute to the development of new social models evaluating how the evolution of science in ancestral societies affects their social structure. We may be able to make inferences about the cycle of social interaction, resource allocation, extent to which astronomical information was used, and other socio-ceremonial activities of the Ancestral Pueblo people of the Mesa Verde. Among the many mythic, lithic, features of the landscape in Navajo (Diné) country, Sonsela Buttes located near beautiful Canyon de Chelly, has particularly interesting significance from the standpoint of Diné tradition, geography and geology. Indeed, from the traditional point of view, one could even say that they are significant in cosmogony. A Diné story and accompanying lore suggest that when Coyote flung stars across heaven some fell back to earth and landed where Sonsela Buttes now stand; thus the name, meaning "stars lying down." A layer of sandstone dating to 227 million years ago, responsible for depositing and protecting the world's most famous and beautiful petrified wood within what is now Petrified National Forrest, also bears the name Sonsela. This paper explores relationships between legend and geology relating to Sonsela Buttes. 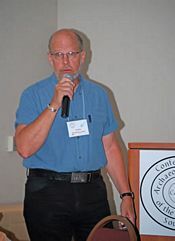 The many years of research by Jerry Howard and others on the prehistoric canal systems of the Hohokam in the Salt River Valley in South central Arizona give us an insight into the engineering abilities of these early people. The research shows that these canals have an almost perfect grade for moving water over long distances following the curvatures of the land without eroding the bottom away or allowing much sediment to build up. All these factors would seem to indicate that these people possessed a devise of some type to survey the land and determine the grades. This is also true with the research of prehistoric astronomy in the same area. The Hohokam people divided the horizon between summer solstice and winter solstice into four equal parts. They determined these alignments for both sunrise and sunset. The location of the equinox’s alignments was within ½ a degree of center between the solstice alignments and the locations of where many of the 37 mound sites were placed on these alignments. 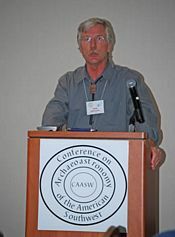 The research presented in this project reviews both the archaeological record and the ethnic record to determine what type of devices might have been used and what tools and other knowledge might have been needed to produce the results found in the archaeological record of the Southwestern United States. There have been numerous archeoastronomical studies in other prehistoric areas of the American Southwest, but in the Mogollon this research has languished. This paper attempts to address this shortcoming and to make some modest inferences that are broadly in tune with other current archaeological research in this area. The Gila Cliff Dwellings is the only National Monument representing the Mogollon culture and because of its protected status, it was a natural candidate for astronomical research. During the past three years, I have conducted archaeoastronomy research in and around the Gila Cliff Dwellings. Adobe Canyon is a small NE/SW facing canyon that empties into the Gila River about a mile below Cliff Dweller Canyon. The mouth of the canyon is marked by a number of pictographs, which include; negative handprints, deer or quadrupeds, a crescent moon, and a rectangle box. These pictographs are placed strategically around the mouth of the canyon to provide sun and moon watching stations. The canyon provides a natural calendar, which marks the rising summer solstice sun and the winter solstice sunset. I have been documenting the entire sequence of rising and setting full moons as well as rising and setting solstice suns. In our efforts to promote the highest professional standards for field work in Southwestern Archaeoastronomy we would do well to be mindful of important lessons from our own discipline's past. Among the most prominent and powerful of these are three that were products of the work of archaeoastronomers at Penasco Blanco, Wupatki Pueblo, and Casa Rinconada. Although the matter seemed to have been settled in 1975, some 21st century writers who have written about the Penasco Blanco "supernova" site apparently still have not perceived the substantial weight of the ethnographic evidence that has been brought to bear on it. In fact scholarship about these pictographs did produce a potent case study that shows why it is imperative that we employ well-defined ethnographic evidence. Wupatki Pueblo provided us with a conspicuously clear case study concerning the importance of obtaining all pertinent historical records and documents about a site. Interpretation here hinged on the matter of the presence or absence of a single architectural feature (a window) for which there actually is documented evidence. At Casa Rinconada the primary concern was about the exactness of the size, shape, and location of a specific feature (an opening in a wall) rather than its presence or absence. The feature was known to have existed prior to this Great Kiva's reconstruction. The hard-line lesson here is that the chanciness of the reconstruction sabotages confidence in arguments about the intentions of the original builders. Photographic documentation has the power to persuade even the most serious of skeptics concerning the sophistication of ancient astronomical knowledge. The testing of hypotheses concerning the horizon sun and moon by a camera is a vital element in archaeoastronomy, and we present cases where suggested horizon events have been disproved as well as confirmed. While it is important to support the assertion of structural alignments and the astronomical purpose of specific sites via cultural tradition, it is the photograph that provides the most convincing evidence, pro or con. Because sunrise and moonrise photography places the modern observer in the same setting as in the past, it can lead to a deeper understanding of the full meaning of these events for ancient people. We discuss the use of photographic documentation of horizon events taking into account issues such as the changing obliquity of the ecliptic, identification of observing site, symbolic importance of the landscape, and public/private access to the ceremony. Solstice sunrises are not useful for correcting the calendar but they can provide impressive ritual drama and opportunities for social integration. In the Chacoan world visual impact was an important feature of the placement of great houses, and we assume visual drama was important in the communal viewing of astronomical events. We will present photographic examples of solstice and lunar standstill events at Chaco, Chimney Rock, Comb Ridge, Hovenweep, Mesa Verde, Yucca House, and Yellowjacket, describe their significance, and the technical circumstances under which the photographs were made. 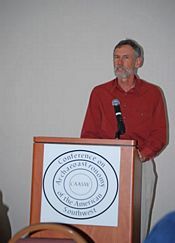 The question of Mesoamerican cultural influence on the development of the ancestral Puebloan peoples of northwest New Mexico is far from resolved. Some authors believe that Mesoamerican influences are insignificant. This presentation will use archaeoastronomical observation and ethnographic data to support the process of seeking an understanding of the history of the ancestral Pueblo people. In the Largo Canyon drainage a discovery was made of four pictographs, generating light and shadow interactions, which appear to be calendrical constructs for the winter solstice. The 2:30 pm pictograph appears to be a sun symbol made of 20 red rays unevenly spaced with a badly eroded white anthropomorph in the center. At the base of the talus slope below this "sun" are two boulders placed in a V- like formation. The azimuth of the "sun" from the "V" is zero degrees with an elevation of 36 degrees. When one is standing in the "V" looking at this pictograph, one is in fact looking at the north celestial pole. The photos of the four pictographs were shared with members of the Jemez Pueblo archaeology department. They stated with certainty that this is a winter solstice ceremonial site. Also, given the Mesoamerican cosmological importance of the north celestial pole in the act of creating the sky, it is hard to ignore a cultural correlation. Hopefully, this discovery will generate interest in studying the site to find its cultural significance in relation to the history of the Pueblo people and explore the question of protecting the site. Rock art Panel III at Roundy Crossing, a post-classic Mogollon village in Linden, Arizona, is an easily recognized petroglyph view of the winter sky. The village has extensive astronomical petroglyphs that date it to exactly 1168 AD when a one-day alignment of the planets was extensively recorded. The creator of the rock art panel III petroglyphs was familiar with the Mayan myth of the dawn of creation. My reasons for assuming this are several: 1.) the constellations do not otherwise match other constellations displayed in detail as petroglyphs at the same site; 2.) following the story told by the winter constellations tells stories found in the Central American Popol Vuh; and 3.) there appears to be animals represented in rock art panel III that are typically found in South American and not North America. The Solstice Project will present an interactive computer model of the Sun Dagger in Chaco Canyon, an astronomical site of the ancestral Pueblo Indian culture. The Sun Dagger site commemorated the cycles of the sun and the moon in light patterns cast by rock slabs onto spiral rock carvings. With state of the art technologies, a team of photogrammetrists, a geodesist and computer modelers developed an archival digital restoration of the site in a computer model with extensive interactive capability. (In 1989, the Project found that the rock slabs had shifted and the light markings on the petroglyphs had been significantly disturbed.) The model offers dynamic opportunities for exploration of the site. One can navigate around the 3- D model, observing it from any angle, set the calendar date and time of day for positioning the sun and moon, which project shadows of the stone slabs onto the cliff and spiral patterns in real time. The slabs and the spirals can be adjusted in their positions and shapes and the adjustments precisely measured. The student or scholar is in a sense in the role of a Chacoan astronomer, testing the sensitivity of the elements of the site and assessing what actions may have been taken by the Chacoans to mark the sun and the moon. On a trip up Montezuma Canyon in Utah, in search of the Coal Bed Canyon ruin, we instead found a mesa in the bottom of the canyon, isolated on all sides from the main canyon walls, with a ruined pueblo of some 100-foot length at its south end, littered with ancient pottery shards. At the north end of the hill was a large petroglyph boulder marked with designs including two counter clockwise spirals. The distant horizon was visible from the spirals. About 15 yards away was a stone located on the lines from one spiral to the southernmost possible sunset (at Az=235 +- 3), and from the other spiral to the southernmost possible moonset (at Az=230 +- 3). We hypothesize that the dwellers in this small pueblo had a local site which marked the passage of time within the year and, like great cities at Chimney Rock or Chaco Canyon, within the 18.6-year lunar cycle. Since the discovery of Northern Lunar Standstill rising between the twin spires of Chimney Rock by Prof. Malville in 1988, my research has turned on his suggestion that the opposing ridge to the west of the Piedra River may have astronomical and calendrical significance. By viewing the rising of the sun, moon, or other luminaries through that distant foresight, ancient astronomers could have coordinated planting and festivals. I have photographed the equinoxes, lunar eclipses, summer solstice, and the MNSS from various habitation sites that string along this high fault escarpment, which extends south to NNW for over five miles. Because the district is essentially unexcavated, there is little dating, but the existence of a Chacoan so-called Equinox Pueblo, rubble mounds, numerous pit-houses, monoliths, and probable shrines suggest that astronomy played an important role in site location during the 200 or so years of occupation. There are exciting opportunities for future research. This avocationalist researcher’s personal odyssey in the Celestial Southwest is an ongoing study comparing ancient visual astronomy texts and translations and certain semiotic, sign-language communications left to us in the Ancestral Puebloan and Mimbres Southwest. These juxtapositions concern ancient transitory celestial events such as the great comets in history and the 8 historical supernovae. 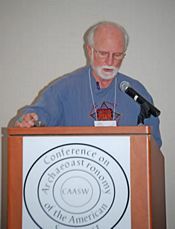 This multi-disciplinary researcher’s comparisons are oftentimes reliant upon ancient constellation indications communicated in the rock-art panels which used natural cracks in the stone canvas to mirror the Wheel of Heaven’s revolving and seasonally varying nighttime star-signposts overhead. Graphically-portrayed cometary-detachment apparitions and superbolide events, understood in terms of art-historical iconography are also studied. 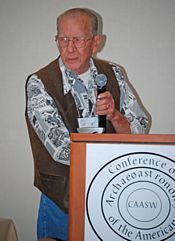 Archaeoastronomers in the American Southwest tend to be isolated individuals, with deep, serious interest and technical ability who work alone without any support from institutions, government, and even peers. 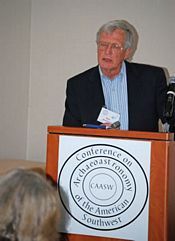 This paper describes that lack of a Center which can hold the field of archaeoastronomy in the American Southwest together, and suggests ways to improve this situation. Examples of the frustration the authors have experienced include: Failure of National and State Parks in New Mexico to stock a local archaeoastronomy book (despite having novels on Floridian Swamps at El Malpais National Monument, where the book has been rejected multiple times), no local mechanisms to fund research, lack of any physical place to find local archaeoastronomical books and materials and no mentoring from professionals to the amateur community. 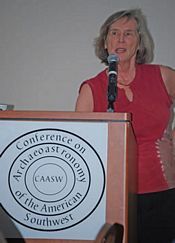 Five suggestions could improve the situation for archaeoastronomical research in the American Southwest. First, find a group or institution (ideally within each Four-Corners state) willing to create a clearing house, library and research Center which promotes archaeoastronomy in the Southwest. Secondly, find local academics who are willing to mentor local researchers to improve the quality, output and publication of research. Third, helping researchers find mini-grants for research, conference presentations, and providing venues for presentation of results. Fourth, emphasize the fragility of the resource and attempt to gain funds for documentation and conservation. Lastly, in the absence of a physical Center, create a virtual network of researchers in the Southwest would open a channel for continuous dialogue, exchange and collaboration in American Southwestern Archaeoastronomical research. This large and complex site, containing some 20 kivas and 200 rooms, is best known for a line of 14 monoliths separating kivas and room blocks from ceremonial space containing a C shaped shrine. At Yellow Jacket, 5MT5, a monolith wall, oriented to June solstice sunrise, separates room blocks and kivas from a similar shrine. The Coal Bed monoliths have variable heights and some been carefully shaped into rectangular prisms. The line has an orientation of 183.6o, which is less than a standard deviation from other collections of north-south structures such at Grass Mesa Village (N=28; average 182o; stdev = 12o) and Alkali Ridge (N=15; average = 178o; stdev = 8o). The earliest of the north-south great houses of Chaco, Pueblo Alto, has an orientation of 177.8o. This kind of error in establishing north-south may have been common before the introduction of the technique of shadow casting in Chaco. The shrine contains two Mesa Verde type pecked basins in its bedrock floor and appears to mark sunset on November 17. The central hill contains major defensive features, which probably date to the late 13th century, a time of warfare and violence. Similar defensive strategies are found at Sand Canyon and the pinnacle sites of Kayenta and the San Juan Basin. A boulder north of the hill contains two intertwined spirals and is the last illuminated feature in the area at December solstice sunset. An alcove on the southern side of the hill contains petroglyphs that appear to mark equinox sunset.